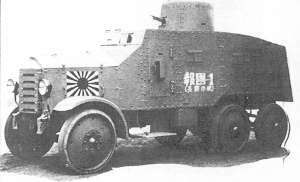 The first domestically-produced armored car mass-produced for the Japanese army for service in China was the Type 92 Chiyoda. 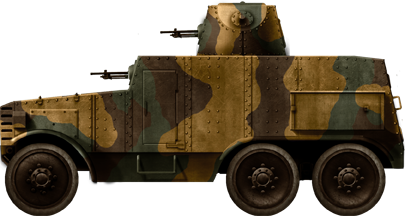 It followed on from the Type 87 armored car, which was based on locally-produced Wolseley British chassis, engine and components. At that time, the Army searched for a better protected vehicle with good off-road capabilities. 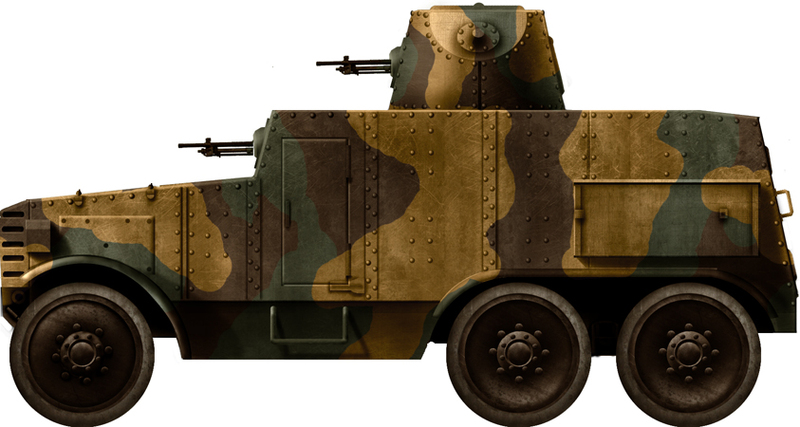 These requirements led to a 6×6 design, similar to the later Type 93 Sumida. The prototype was ready in 1931 and successfully passed all trials. 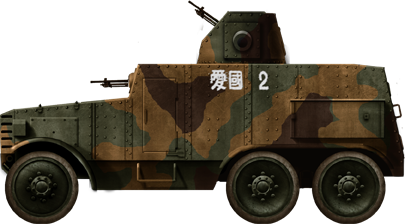 It was officially adopted as the Type 93 Chiyoda Armored Car, named after the builder, Chiyoda from Tokyo. In western literature, the corresponding designation is often “Aikoku Armored Car”. 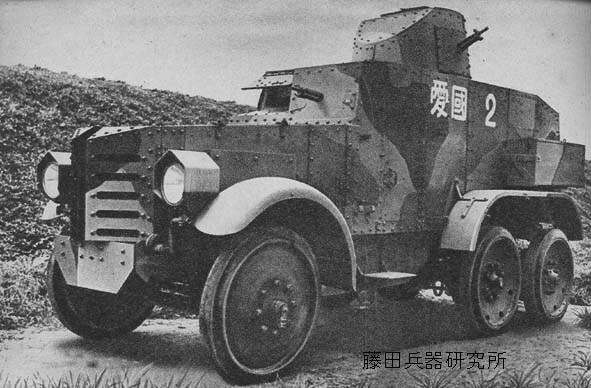 This may be due to some 1932 Shanghai Incident papers which mentioned the “Aikoku-Koto”, the “Public Party of Patriots”, that helped fund the construction of these vehicles. It is also sometimes confused with the Type 90 Sumida. The Chiyoda Motor Car Factory belonged to Tokyo Gasu Denki K. K., or Tokyo Gas and Electric Industries, and is nowadays named Hino Motors Ltd. It had previously produced the Model QSW 6-wheeled truck. 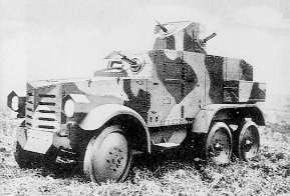 In 1930, it was chosen to design the new army armored car, and submitted blueprints. The basic armor scheme was, in many ways, similar to that of the Type 87. However, the spoked wheels with pneumatic tires had been found to be too fragile and were replaced by disk wheels with fixed rubber bands. The hull was made of rolled homogeneous armor, possibly 6 mm (0.24 in) thick, enough to withstand shrapnel and light arms fire, and was riveted around a central frame. The compartmentalization was straightforward, with a frontal engine protected by armored shutters, a headlight protected by covers. 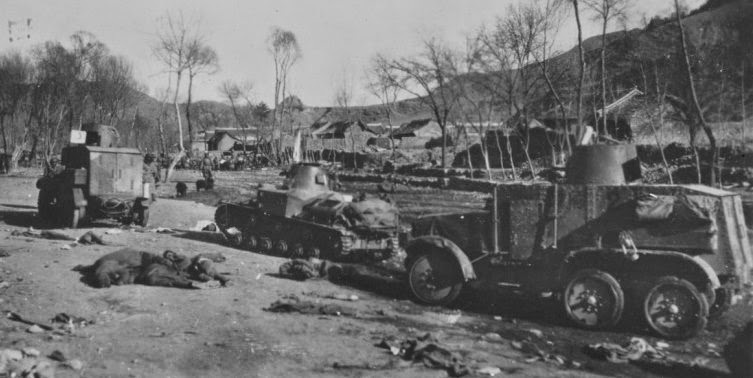 The driver’s compartment came after, with the driver on the left hand side and gunner taking place to his right, firing a standard light Type 92 machine-gun. The fighting compartment behind extended to the rear, with a revolving truncated conical turret. Three visor ports were placed along each side of the fighting compartment. Access was granted through side doors for the driver’s compartment and through rear doors for the fighting compartment. The turret had an AA mount on its frontal slope, and another MG was located in one of its side ports. Storage boxes were fastened over the rear axle mudguards. Normal armament provision comprised three Type 11 6.5 mm (0.25 in) machine-guns, replaced during WW2 by the more compact Type 91. The vehicle was propelled by a Wolseley 4-cyl gasoline engine, producing 75 hp for a power-to-weight ratio of 13.4 hp/t, enough for an estimated top speed of 60 km/h (37 mph) on road. 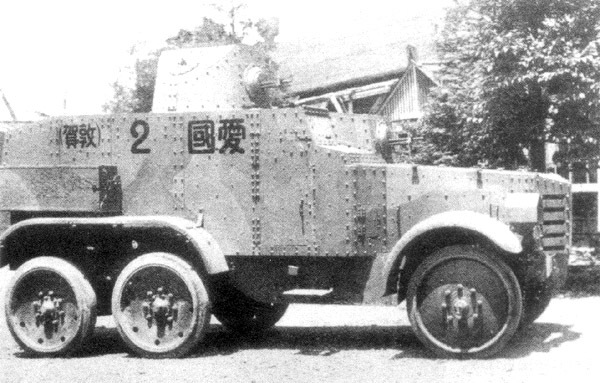 An estimated 200 Chiyoda armored cars were produced and participated in the 1932 Shanghai incident and subsequent IJA operations in China in the mid-1930s. They provided both infantry support and security duties in the captured regions. 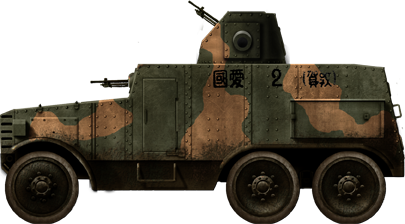 Starting in 1937, the Chiyoda were gradually replaced by the Type 97 Te-Ke tankette, which had far better mobility. Unknown unit, China, 1930s. The illustrations shows the turret turned sideways. Unknown unit, China, 1930s, showing the turret turned forward, with its AA LMG. Notice the absence of an AA MG on the truncated sloped part of the turret, and the fixed Type 11 front MG – Credits: Ikazuchisen.wordpress.com. 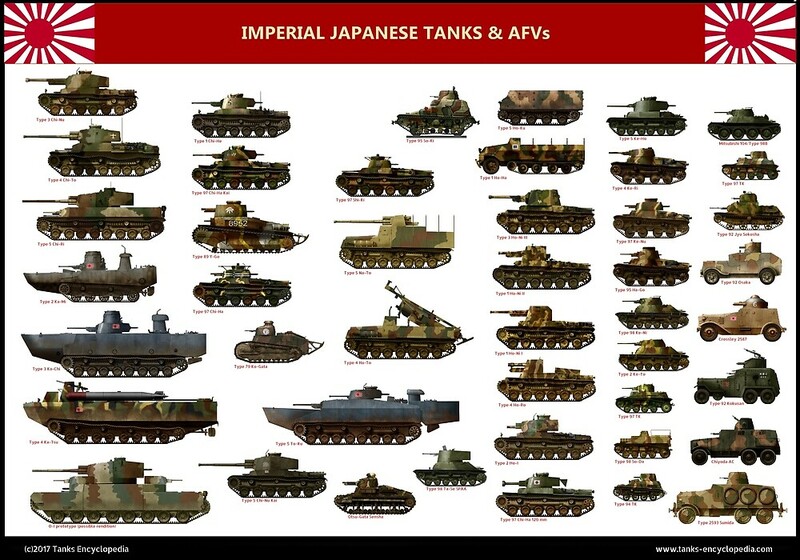 Get the Poster of the ww2 Imperial Japanese Army Tanks and support us ! Good interesting site.Have just purchased 1/35 resin kit of this vehicle made by Fairy Kikau from Hobby Link Japan.Have most of their other kits basic but look ok and easy to build certainly fill the gap in IJA armour collection.Had my fill of Panthers Tigers and 1946 paper tanks.Something a bit different ignoring the history of the atrocious events of the time period. 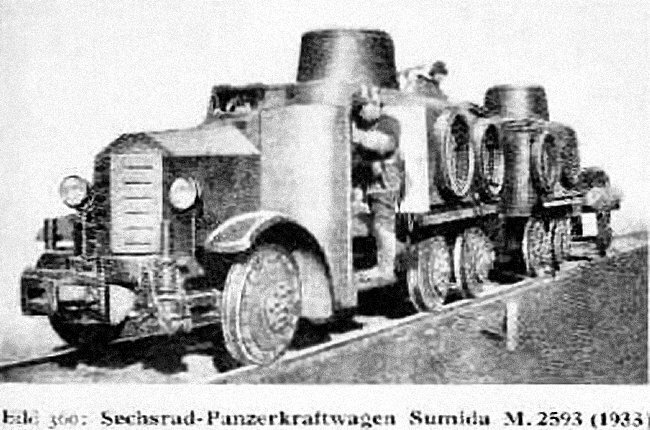 The second thumbnail photo “Chiyoda of unknown …” is actually a Sumida Naval Armored Car — a road-only going version of the Sumida convertible rail-to-road model. Totally different armored car, though the configuration is similar. Also it is bearing Hokoku markings not Aikoku. Both are representative of donation organizations in Japan. Think of “Aikoku” as a group you’d donate to ending up in having armored cars sent to where your loved ones were fighting or maintaining the peace.